Nel, author of Dr. Seuss: American Icon, delivers a meticulously researched and scrupulously attributed commentary on Seuss’s revolutionary 1957 beginning reader, The Cat in the Hat, its sequel, The Cat in the Hat Comes Back, and three short published pieces. 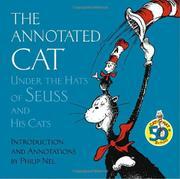 Nel’s introduction uncovers publishing histories, reviews, translations, adaptations (as animated television cartoons, for example) and tributes to Seuss and his Cat (including parade floats, commemorative postage stamps and a memorial sculpture). Nel recounts details of the Cat’s birth: Seuss, exhorted in print by John Hersey to supplant the boring primers of the day with books that made learning to read fun, accepted the challenge. Saddled with a stipulated word count (the first Cat has 236) and a confounding list of permitted words, Seuss’s anticipated lark took a year and a half to complete. Nel’s material most compels when providing both visual and literary proof of Seuss’s creative process, documenting recurring motifs from his work in advertising and political cartooning and revealing cultural influences ranging from the Katzenjammer Kids (think Thing One and Thing Two) to the atomic bomb (on the cataclysmically cleansing Voom in the second Cat). The fact-packed verbiage—seeming at times a gaudy inverse to Seuss’s musically spare texts—discusses everything from the debate as to whether the Little Cats in The Cat in the Hat Comes Back are fractals, to the probability, based on “an unscientific sample of shoe prices” in 1957, that Dad’s $10 shoes “would have been moderately priced dress shoes.” While the aftermatter is impressively rich, photos and other visual documents are captioned only in the introduction—bound to cause all but the most casual reader to rue the lack of an index. The handsome, double-column layout of the annotations contrasts with the presentation of the Seuss texts, whose double spreads appear on right-hand pages, clipped slightly by the gutter. Revelatory, exhaustive and, occasionally, exhausting.